I-Team in Seattle: What would Amazon HQ2 look like in the Triangle? SEATTLE (WTVD) -- It's being billed as the biggest delivery yet: Amazon sending a package of a new $5 billion headquarters and 50,000 high paying jobs, and Raleigh-Durham could be the destination. According to Amazon, the company's new headquarters - dubbed "HQ2" - will be a full equal to its current campus in Seattle, which already includes 8.1 million square feet of office space - and counting. After reviewing more than 300 submissions from cities large and small, Amazon announced earlier this year its short list of 20 finalists. The decision is expected later this year, and if the Triangle is chosen it could have a far-reaching impact on everyone in the community. The ABC11 I-Team spent several days in Seattle to give our viewers an exclusive look inside the tech giant to help us understand what it is many politicians and business leaders are wishing for. As Washington's Mount Rainier is the tallest peak in the continental United States, Seattle's Amazon sits at the top of America's economy. The company, which has encompassed everything from Amazon.com retail to Amazon Studios, is simply a behemoth, with a headquarters so large that it dominates what was already a popular destination in Downtown Seattle. With the 38 buildings and 8.1 million square feet of office space, Amazon's headquarters has more real estate in Seattle than any other company in any other city in the United States. Sam Kennedy, an Amazon spokesman, told ABC11 that Amazon has invested over $4 billion in its urban campus in Seattle's Westlake and South Lake Union districts. The company currently employs more than 45,000 people. According to an employee survey, more than 70 percent of Amazon employees in the region live in the city of Seattle. About 55 percent of Amazon's Seattle employees use public transportation, walk or bike to work (more than 20 percent walk to work and the rest bike or take public transit). "What we're trying to do here is invent for our customers every day," Kennedy said as we began our tour in a building called Day One. "Every day is Day One because there's all different kinds of ways and opportunities to find your creative outlet and think about the next big idea." Those ideas are hardly created in offices; each and every Amazon building comes complete with meeting spaces that look more like airport lounges. There are also dog parks, playing fields, a free banana stand, art installations, an art studio, several big community coffee stations and even a bike room. "One of Jeff's philosophies is no team should be bigger than two pizzas," Kennedy added, quoting Amazon's founder and CEO Jeff Bezos. "It's the idea that teams are able to work more collaboratively in smaller settings and move faster and invent quicker on behalf of customers. We make movies through Amazon Studios, we are one of the largest cloud providers in the country. We do groceries today, PrimeNow. There's a whole litany of options and items that we have for customers." The epicenter of Amazon's campus (or neighborhood, as Kennedy calls it) is the Spheres, a botanical oasis complete with 40,000 individual plants from 50 countries around the world. "It's very peculiar, so we start right there," Kennedy said, pointing to a 4,000 square foot wall meticulously organized of plants of every shade of green. "The main thing that's missing from an urban campus is green space, access to the green. This is access to greenery from all over the world and it's also an educational opportunity." The epicenter of Amazon's campus is the Spheres, a botanical oasis complete with 40,000 individual plants from 50 countries around the world. The exterior structure of the Spheres is made of steel and is laid in a specific symmetric design repeated 166 times. The architects also designed the structure in a way that the glass sits on top of pegs as an exterior facade. The glass, moreover, is specially equipped to filter out UV rays that could be harmful to plants. 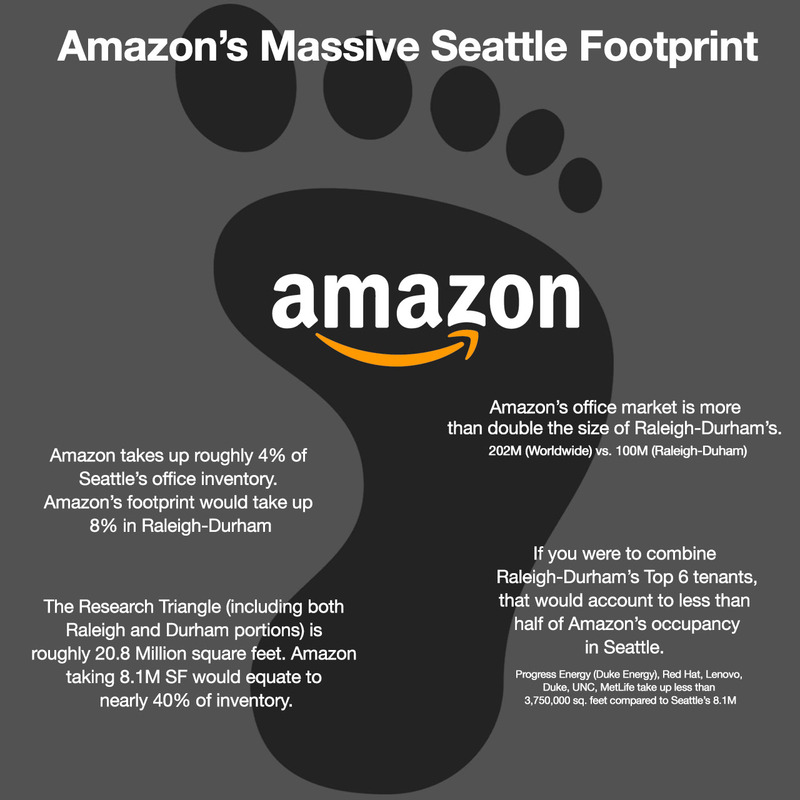 If you were to combine Raleigh-Durham's top six tenants, they would amount to less than half of Amazon's occupancy in Seattle. Progress Energy (Duke Energy), Red Hat, Lenovo Group, Duke, UNC, and MetLife take up just less than 3,750,000 square feet of office space in Raleigh-Durham compared to Seattle's 8.1M in Seattle. If you were to combine all existing office space in Research Triangle Park (IBM, Cisco, GSK, etc. ), it would still not be enough to house Amazon's HQ2. Some cities like Chicago and Boston offer full transparency for their bids, including proposed locations, as well as transportation and housing plans. The leaders behind the Triangle's bid, however, telling the I-Team they've entered into a Non-Disclosure-Agreement. That includes members of the Research Triangle Regional Partnership and Wake County Economic Development. In a statement emailed to ABC11, a spokesman for the North Carolina Department of Commerce said: "While we talk to many companies about the advantages North Carolina can offer their businesses, we do not comment on the details of these discussions until a site selection decision has been publicly released." There is a website touting the Triangle's push for HQ2. It promotes the hashtag #TriangleDelivers and names six "partners": the Research Triangle Regional Partnership, Wake County Economic Development, Chatham County Economic Development, Durham Chamber of Commerce, Durham County Economic Development and the Research Triangle Park Foundation. The site states: "The Research Triangle proposal will focus on the strengths of our region, including the incredibly talented and highly educated workforce, diverse and innovative economy, the robust startup scene, globally recognized higher education system and top-notch quality of life. The story for our region addresses the preferences and interests of Amazon, and our proposal works hard to reinforce the trajectory of this region and deliver a strong case for consideration."